Things have been going quite well in my garden this spring. We’ve received several bouts of heavy rain, but not so much that there have been floods that would damage roots. In between bouts of weeding (a never-ending chore) I’ve been having fun watching the succession of spring flowers in my garden. First up were the daffodils, then came bearded iris and now the roses, purple coneflowers, and mealy blue sage are strutting their stuff. Alas, roses and other spring flowers aren’t the only thing to appear at this time of year. Every spring near the end of April I begin to see tiny dots appearing on new leaves. At first they are hardly noticeable but every now and then they really burst out on one or two of my growing herbs. 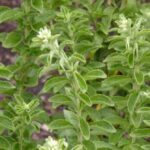 This year it was the stevia that really got hit. Here’s a close up of the damage. 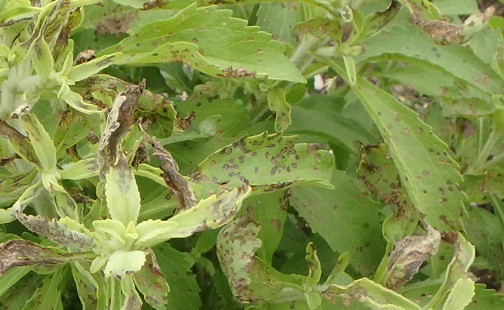 Spring damage on my tender stevia leaves is a clue to an unwanted garden pest. Note the dark spots on the leaves. It almost looks like someone sprinkled black pepper on my herb but I know better. This is the tell-tale sign of the four-line beetle. See it in the photo? Of course you don’t. They are small and very fast at hiding. Here’s a close-up of the critter that is making all those spots. Photo of 4-line beetle courtesy of Rutgers University. These beetles are really tiny – about 3/16 of an inch long. They are also masters at hiding. I get these bugs every year but I’ve only seen a few now and then. So guess what I’m going to do about them? Absolutely nothing. These pests are annoying but they do very little damage. Four-line beetles only seem to like the new, tender spring growth. Furthermore, they disappear as soon as the daytime temperatures start to climb to 90 degrees and above. I’ll just wait until the warm weather comes and then clip off the unsightly but not-life threatening damage. Now I see them (or rather the damage they leave behind) but soon I won’t.